Each month, Beaver Toyota partners with a local organization that is working to do good in our community and together we make dreams come true. 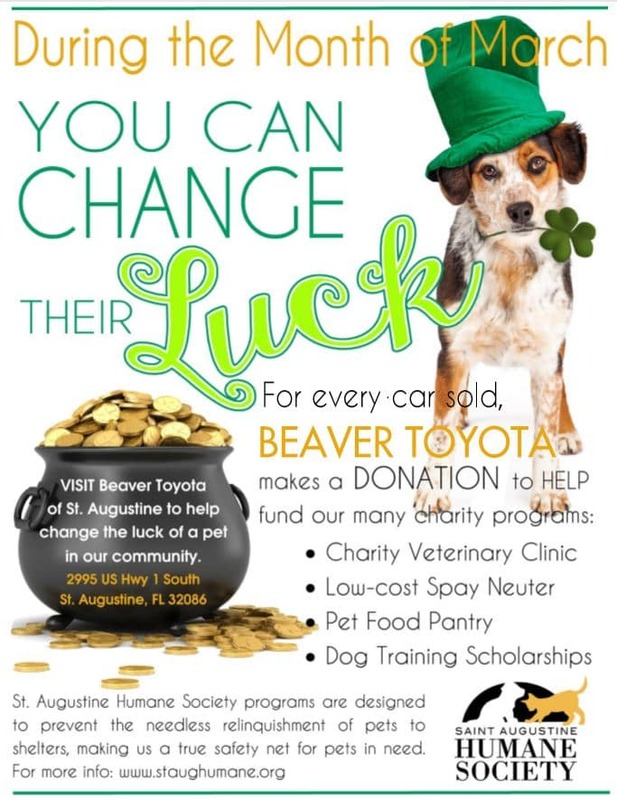 Beaver Toyota donated $1,000 in March to the St. Augustine Humane Society and hosted a successful pet adoption! St. Augustine Humane Society (SAHS) was established in 1946 and has remained at the same location. Over the years, it has transitioned from serving as the County animal shelter to its current operations as a resource center. Today it is focused on preventing the need for pets to enter shelters and preventing overpopulation. Programs are designed to ensure that all pets have access to the care they need, making the organization a true SAFETY NET for pet owners. The SAHS Resource Center is home to a low-cost veterinary clinic, spay neuter surgery center, pet food pantry, dog training, and Society Pet Spa.